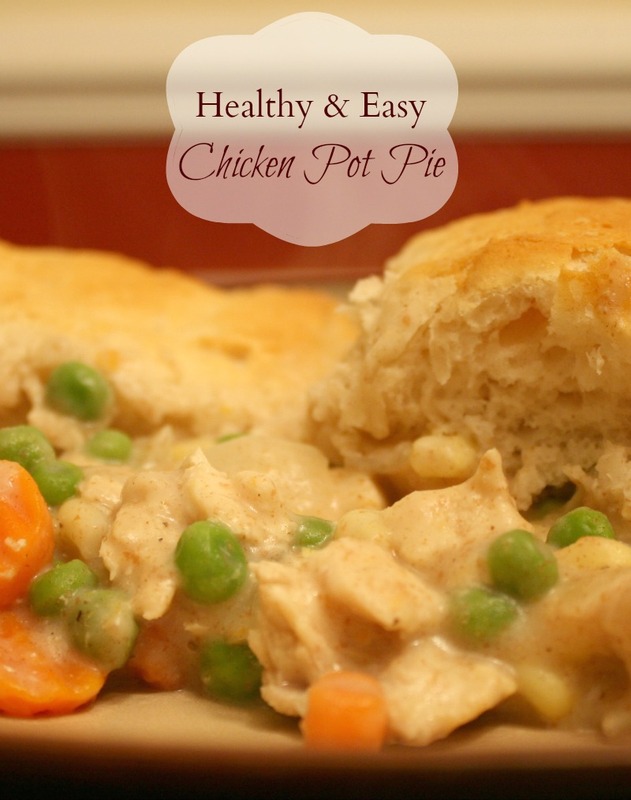 I’ve been trying to make a healthier, low-calorie chicken pot pie recipe for a while. This one is perfect! There’s no butter or canned “cream of anything” soup. Plus I used whole wheat flour and 2% milk to make it even lighter. The chicken is incredibly juicy, the vegetables are perfectly tender and the light sauce brings it all together nicely. This recipe is perfect for weeknights since it’s so quick and easy. If you don’t have time to bake the chicken, simply pick up a cooked rotisserie chicken and shred it up. You can use a pie crust or make biscuits using Bisquick, but I made it one step easier and used refrigerated Pillsbury reduced-fat buttermilk biscuits. If you give it a try, come back and let me know what you think! Like this recipe? Pin it for later! Plus, find more easy recipes here! Wow – a low cal pot pie! I’ll have to try this! This sounds delicious – love that it’s a healthier option to a classic! We love pot pie!! This is a great recipe especially with it being low cal! Looks soo yummy! This sound awesome! I haven’t had a chicken pot pie in years! Me either! So I HAD to make a healthier version. This looks yummy! And I love chicken pot pie – I can’t wait to try it out! That sounds good, and I love the substitutions you made. Can’t say I eat chicken pot pie, but it does sound easy enough to make. I bet it probably even taste better than the frozen kind you get at the store. Oh man! This looks amazing, and it’s LOW FAT? I think I’m in heaven! Thanks for this great recipe! My kids love pot pies, too, so this will definitely find it’s way into my meal planning soon! Thanks for all the lovely comments! If you give this a try, I’d love to hear how it turned out for you! I’ve tried a lot of “easy” pot pie recipes, but oftentimes it ended up that they were so easy that they had little or no flavor. That being said, this recipe was awesome! Only things I did differently was use a refrigerated pie crust in place of the biscuits, and skim milk instead of 2%. When I make this recipe again, I think I’ll add a little salt to the filling but otherwise it’s perfect! I also really loved that you didn’t use any canned soups because that made the dish healthier and a little cheaper for me. I will definitely be making this often! Thanks for the recipe! So glad you liked it, Katie! I love when people try recipes and let me know how they are! Can anyone tell me roughly how many people this feeds? Hi Kendra, My family of 3 got 2 meals out of it. So about 6. Trying this recipe now – it says 1 1/2 of milk – is that Cups? Tablespoons? Teaspoons? That’s cups. Hope you like it! I’m going to try this tonight…if I use a pie crust, would I use a pie plate and use top and bottom crust, then cook as recipe states? My family of 3 got 2 meals out of it. So about 6. I loved it! Very good. My husband and I used to buy a boxed dinner similar to this and add more vegetable and chicken. We just didn’t know how to create the base….now we do and it is delicious. We added a potato also.. very yummy! Anyone have any idea on number of calories per serving?? Do you cook the biscuits first? Nope. Just throw the uncooked biscuits on top and cook as long as needed for the biscuits to cook. I made this the other night and it was very tasty. It was nice to make something that everyone liked! I used the rotisserie chicken, skim milk, fresh carrots and corn, and topped it with whole wheat biscuits. Using the fresh veggies added only a few more minutes of prep time. I will make this again. If you decide to use a pie shell and top crust do you need to adjust the cooking time? AWESOME!!!! I made this and did it with homemade pie crusts in a pie pan, if you do it this way them this recipe makes 2 pies so I just froze half the filling for an even quicker dinner in the future. I adjusted my baking time, I upped the temp to 450 and baked until the crusts were golden brown, I baked it for about 30 minutes. For the other half of the filling I let it cool down and then put it in a ziploc bag and laid it flat so it wouldn’t take up a lot of room. I wrote the directions on it for my husband. You can also freeze it as a whole pie with the crusts but since I was using homemade crust I didn’t make enough crust. I made this today it was very good. (it’s a keeper!) ..Love that there is no butter, or lots of additives via “cream of soup”. I added a heaping teaspoon of dijon mustard when I added the milk. I took that tip from Rachel Ray and her pot pie ( that had lots of butter), so I used your recipe with the addition of the mustard. You can’t taste the mustard, but it added a nice flavor. thanks for the recipe! I portioned it out in single sized servings, and will use it with rice for chicken a la king, and with biscuits as you suggested for chicken pot pie during the week. Its nice to have it ready to pull out of the freezer in the morning, or the night before, and finish it with rice or biscuits after getting home from work. Very flavorful! I made a few alterations though. First off, I didn’t have any milk. Instead of shredding/cubing the chicken, I grounded it in my Nutribullet; call it laziness I guess lol. I used 1/4tsp extra of garlic, and I didn’t have any onion. So what I did was boil my chicken (since it was still frozen) with salt and pepper. When it was almost done, I put it on a tray and baked in the oven 350 degrees for about 12 min. On stovetop, I sprayed with canola then added my 3 cups mixed veg (frozen). Let it cook for about 5 minutes. I then added the chicken broth and a mixture of all the seasonings. Stirred and brought to a boil. I then simmered for 5 min. Next step was the flour, as mentioned, til thick. Cook for a few min. **** Now instead of adding milk, I just added more broth (about 1 cup). And then my grounded up chicken. Let it cook for a couple more minutes then poured in a dish, placed Pillsbury Grand Buttermilk (Reduced fat) biscuits on top and baked for about 15 min. I noticed the texture was definitely gritty-like because the chicken was so finely grounded. It was more like a spread texture than a soup. However, the flavors were awesome! Next time I will definitely have milk on hand and dice the chicken instead of ground! Thanks for a great healthy recipe! I’m so glad to hear that you enjoyed it! Thanks for sharing. I’m so glad you enjoyed it. I would love for you to include it! Thanks so much! This recipe rocks! I have been looking for a good pot pie for ages and you supplied one!! I did your recipe a little different though, I put it in a pie pan and baked it for about 40 minutes. But it still turned out soo yummy that even my picky eaters liked it!! Thanks! This makes a ton!! I love it. Can I freeze it after it’s cooked to save some? Can’t wait to try! If you only have canned veggies on hand at the time, does that affect the cooking process? If you cook the biscuits first (I didn’t know if I was suppose to or not) do I need to add the dish back into the oven for the 20 min at the end without the biscuits? Nope. You don’t need to cook them first. first time making this recipe and thought it was pretty yummy. impressed that my 4 and 2 year old like it as they’re a tough crowd! So glad you enjoyed it! And that the kiddos ate it. Made this last night and it was amazing. I used fresh carrots, added celery, cooked them with the onion, then followed the rest of the recipe. I will be making this again. 🙂 Thanks for a great meal! I’ve never had chicken pot pie before but decided I was going to try to make it for me and my parents tonight! I saw this recipe on pinterest and it seemed so easy I knew I could do it :). It came out amazing and my parents loved it!! Thank you! how many calories is this recipe per serving??? I made this recipe and my family loved it. It’s added to my recipe book! Made this tonight and it was great. I didn’t have wheat flour so used AP and skim milk. I also added some salt and a lot more garlic and pepper. It was sooooooo delish. Just came across this recipe and I can’t wait to make it! I’m going to combine it with my two ingredient biscuits for an easy and delicious meal!